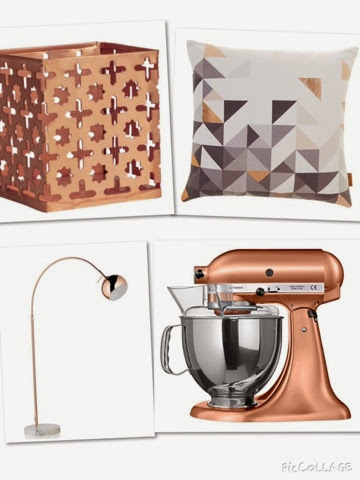 I've been enjoying seeing how popular copper seems to be this season with regards to home appliances, accessories and decor. 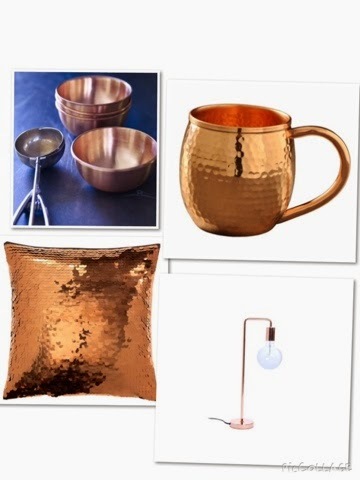 I love the use of metal in the home and there is something so warm and chic about copper as a colour. I know i'm definitely a magpie about home accessories- anything shiny or light reflecting will grab my attention from the word go! All too often metal can create quite a heavy 'industrial' look which I'm certainly not against, but I just prefer a more delicate approach and copper seems to bridge that gap as a beautiful, yet versatile material which can find so many helpful uses in the home. It's functional yet pretty and eye-catching- a total winner in my books. I think of the colour copper as a beautiful autumnal choice which ties in marvellously with the rich golds, reds and browns we often associate with autumn...just look around at the leaves falling off trees for inspiration! I hope some of you find this a useful mood board...let me know what you think!